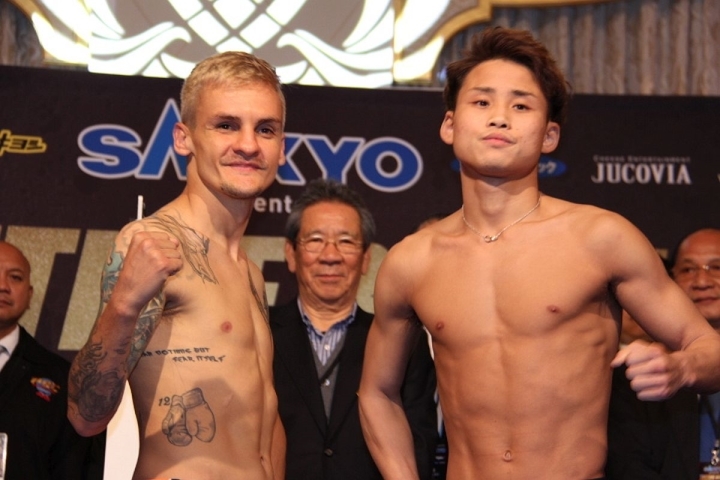 In the evening’s main event, three-division world-champions Kazuto Ioka (23-1, 13 KO’s) of Japan, looking confident and in really good shape made 114.5 pounds, while fellow 3-weight class king Donnie Nietes (41-1-5, 23 KO’s) of the Philippines made the limit of super flyweights 115 lbs.,both warriors standing-fast to collide for the vacant WBO Super Flyweight World Title. Ioka, 29, handled by boxing manager Taku Nagashima, aims at becoming the first Japanese boxer in history to claim world titles in four weight classes; while the veteran, ring-savvy Donnie Nietes, 36, guns at cementing his legacy as one of the most durable and consistent Filipino boxing champions in history. Both men have forged stellar boxing careers, reigning has world champions at minimumweight, light flyweight and flyweight world champions. Who will came-out victorious? In the co-main feature, cool 2-division beltholder Hekkie Budler (32-3, 10 KO’s) one of the most popular fighters to come out of South Africa scaled-in at 106.8 pounds to defend his WBA Light Flyweight World Title against unbeaten, dangerous former IBF Minimumweight World Champion Hiroto Kyoguchi (11-0, 8 KO’s) who came-in at 107.8 lbs. It’s a classic match of the classy, tactical stylist (Budler), against Kyoguchi, a warrior who can press forward, searching for his opponent’s demise, most of the times getting it. Budler, 30, however, knows his craft. 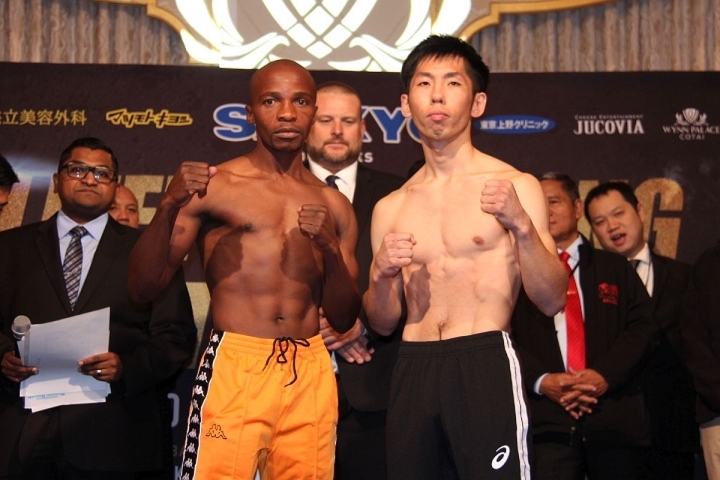 He comes from dethroning tough-as-nails Ryoichi Taguchi (27-3-2, 12 KO’s) last July in a high-caliber, intense, close, blow-by-blow 12-rounder war that the talented South African won with heart and toughness by a razor-thin margin. On the other corner, Kyoguchi, 25, is here in Macao after ravaging unbeaten Indonesian Tibo Monabesa (18-1-2, 8 KO’s) last September, stopping him in four, and now the undefeated Japanese wants to scalp the very accomplished Hekkie Budler, not an easy feat. What will happen? Mthalane, 36, knows the fighting job so well. The man from the land of Nelson Mandela is a two-time IBF 112 lbs world champion, having held the title since July 2018, and previously from 2009 to 2014. In his last battle, Moruti Mthalane survived a rough eleventh round knock down and furious attack from opponent Muhammad Waseem (8-1, 6 KO’s) to win his IBF belt in close unanimous decision last July in Malaysia. Now the man in front is heavy-handed Masahiro Sakamoto. “I ready for him for Sakamoto,” shared Mthalane, standing besides his trainer, top South African coach Colin Nathan. Will the veteran Mthalane still has the necessary weaponry to deal with the glory-hungry Japanese challenger? Or will the highly motivated, young samurai Sakamoto overpower the more accomplished, more experienced African warrior? This triple world title event in Macao, China, on New Year’s Eve is an effort of Tom Loeffler’s 360 Promotions who was in attendance at the weigh-in. Loeffler is in cooperation with Good Luck Good Life Sankyo, TLAROCK, Life Time, Michael Aldeguer’s ALA Boxing Promotions, DEF, Tokyo Broadcasting System and ABS CBN Sports + Action. The author Carlos Costa is a Panama-born boxingscene.com fight reporter based in Cebu, Philippines. He is attending this boxing card in Macao. Carlos can be reached by email [email protected] and Whatsapp: +639184538152.